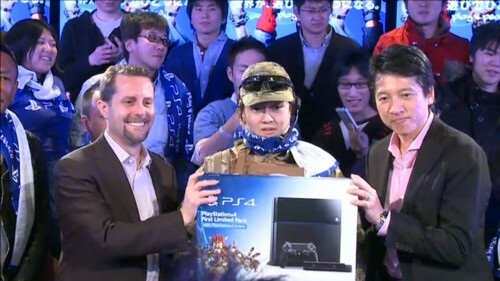 It’s time—the PS4 just launched in Japan. A large crowd was present for the official launch, which was streamed for the world to watch live as well. Japanese musicians, actors, and more gave messages throughout the event. SCE Worldwide Studios President Shuhei Yoshida, SCE Japan and Asia President Hiroshi Kawano, and Sony Computer Entertainment CEO Andrew House all gave speeches, while many game developers chimed in with their own thoughts and best wishes, either in person or through video messages. Exhibition matches of Killzone: Shadow Fall and FIFA 14 added to the gaming atmosphere. Notable moments include when Shinji Hashimoto, the producer of Final Fantasy XV and Kingdom Hearts III, took the stage, and was almost sent off again by Hiroshi Kawano before he could actually say anything. Hideo Kojima was another noteworthy speaker, making a striking entrance and displaying the limited edition MGS: Ground Zeroes PS4 we showed you earlier. All in all, the PS4’s reception in Japan was quite enthusiastic and we fully expect it to sell much better than the Xbox One there.